Smart Magnetic Mounts Power your iPhone, iPad, Android on the Go! Wireless charging is not new, but current systems are not designed for convenient use throughout the day. MagTarget’s wireless magnetic power docks merge the worlds of wireless chargers and mounts into a simple solution. The patent pending magnetic charging system allows simple touch-to-charge and the flexible design of the mounts provide endless powers on the go! MagTarget also offer wire-free USB connectivity to perform tasks such as downloading photos or using your device as an external drive, without having to pull out a wire. To provide the best user facing experience possible the docks are fully adjustable and allow the phone to rotate from portrait to landscape while still maintaining electrical connectivity. 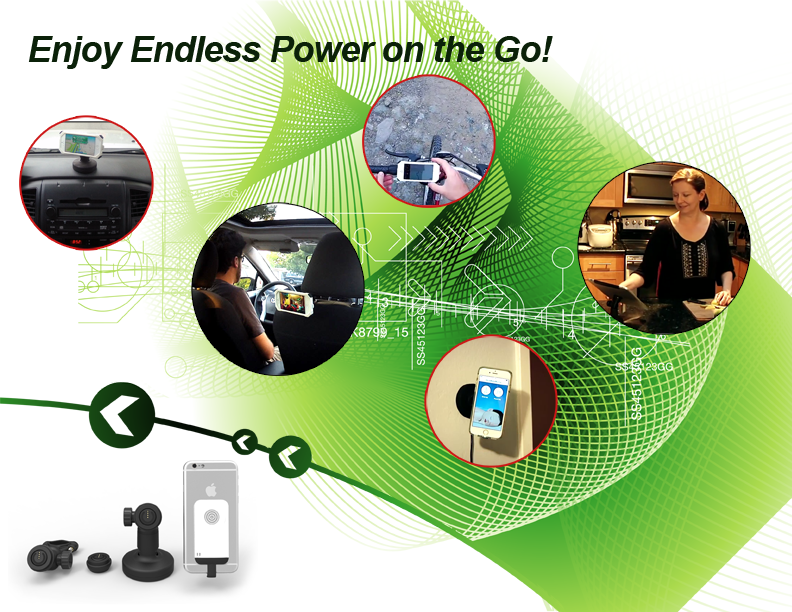 When installed in the car the MagTarget dock can alleviate the fear of running out of power while using the phone’s GPS. Powerful magnets keep the phone in place while driving or biking around town. In fact the current lineup of MagTarget mounts provides twelve pounds of pull force to hold the five ounce iPhone in place. This holding force is focused on the center of mass of the phone with makes it easy to disconnect with a simple twist. MagTarget works with all iPhones/iPads and Android/Windows phones/tablets that have the charging port at the center bottom (which covers the majority of devices). Users can place MagTarget directly on the device or on their favorite case. The patent pending design also has a standard camera mount on the bottom (1/4-20). This allows the use of a whole array of other mounts from suction cups to tripods and everything in between. In addition, MagTarget will be offering its technology, on the device side, free of any license fees via an Open-Source setting. This will allow other manufacturers, in addition to MagTarget, to design cases to cover upcoming devices.